Even though Advaita as a doctrine was extracted from the Upanishads by Sree Sankara, the 8th century sage and philosopher, it was Sree Narayana Guru who transformed the Advaita philosophy from an elite theoretical doctrine into a relevant principle of practical applicability. Thereby, he expanded its scope to effect phenomenal social changes, and enabled one of the most profound yet bloodless social revolution in history. As a social reformer, Sree Narayana Guru's impact was unmatched in history. Those who had been denied basic human rights for centuries were able to experience dramatic changes in their lives due to the awakening caused by Guru's teachings on self-improvement and self-empowerment. The focus on education, organization and entrepreneurism that he insisted on to secure freedom, strength and prosperity remains an ideal and timeless model for peaceful changes in the condition of suppressed and marginalized people of any society. The defining theme of his vast philosophical writings is the oneness of human race transcending all peripheral differences. His earnest call for mutual respect and understanding among all religions is a lesson that is still to be learned. The intention of this well-researched and lucidly-written book is to introduce to readers the illustrious life of the sage, Sree Narayana Guru, who emerged as the conscience of Kerala in the twentieth century. Asokan Vengassery Krishnan hails from a small village near Changanassery in the district of Kottayam, Kerala. After finishing high school, he earned a BS degree in Mathematics from University of Kerala. While working for the Kerala government's Department of Education, he immigrated to USA in 1985 and continued his education there. He took a BS degree in Accounting and MBA from Widener University, Pennsylvania. He also attended the University of Pennsylvania and other institutions in the region and studied English Literature, Psychology, Sociology, Western History, Ethics, etc. Asokan has been working at a prestigious international corporation headquartered in Philadelphia, USA for almost three decades. He returned to India for a few years and it was during this time that he began writing this book. After coming back to Philadelphia, he continues to work for the same organization as a senior accounting professional. He has published numerous articles on socio-political issues in various magazines and newspapers in Kerala as well as in many publications of the Indian diaspora in the United States. For more than fifteen years, he has been a columnist for Kamaladalam, a Malayalam monthly from Kottayam, Kerala. 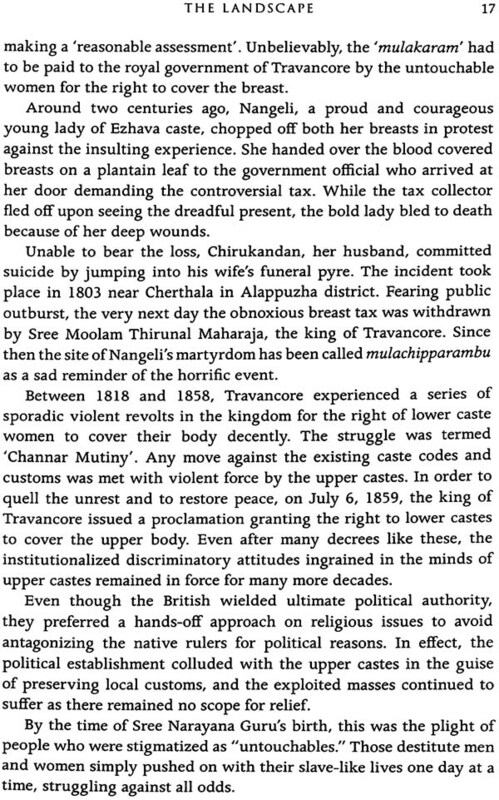 Asokan Vengassery published American Diary, a collection of articles in Malayalam, in 2004 with a foreword written by Perumbadavam Sreedharan, famous Malayalam novelist and a former president of the Kerala Literary Academy. Asokan currently lives in Philadelphia, USA and he frequently visits India. Philosophy and History have been his passion. 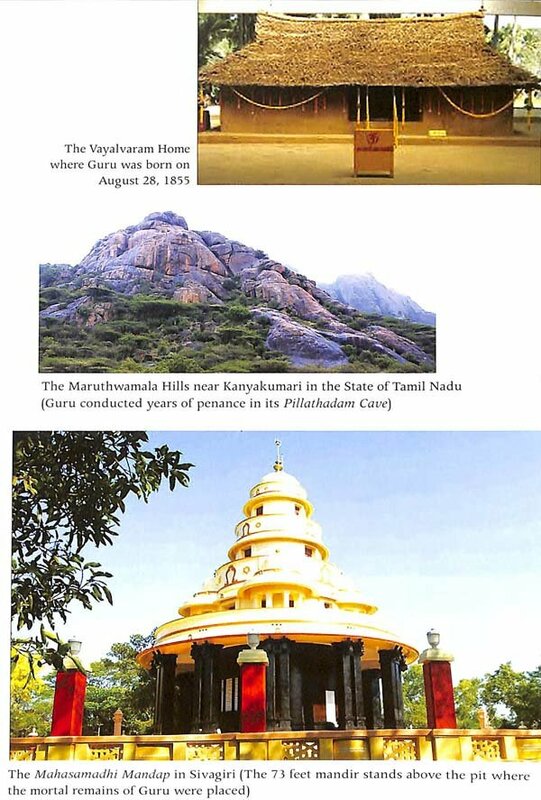 The intention of this book is to introduce the illustrious life of the sage, Sree Narayana Guru who lived around a century ago in the southern region of India. As a spiritual master, philosopher and social revolutionary, he had a profound impact in the lives of millions of people. 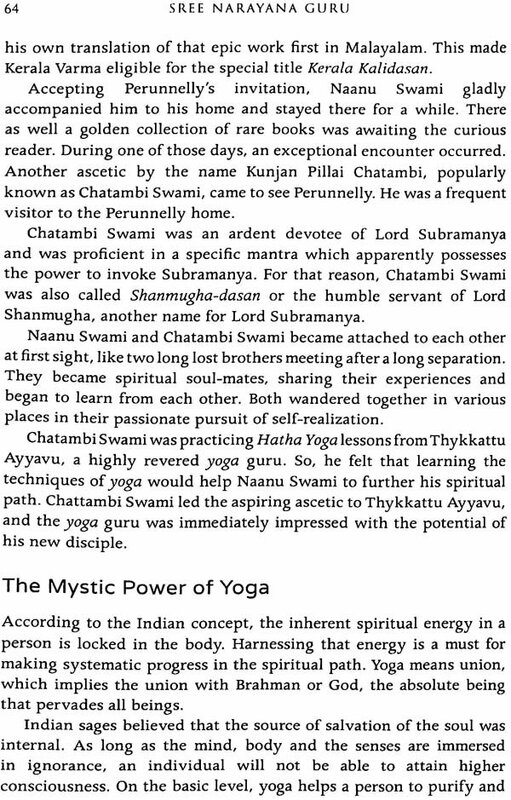 Nobel laureate Rabindranath Tagore described Sree Narayana Guru as a sage of "unparalleled spiritual grace" after visiting him in 1922 at his ashram in Sivagiri. 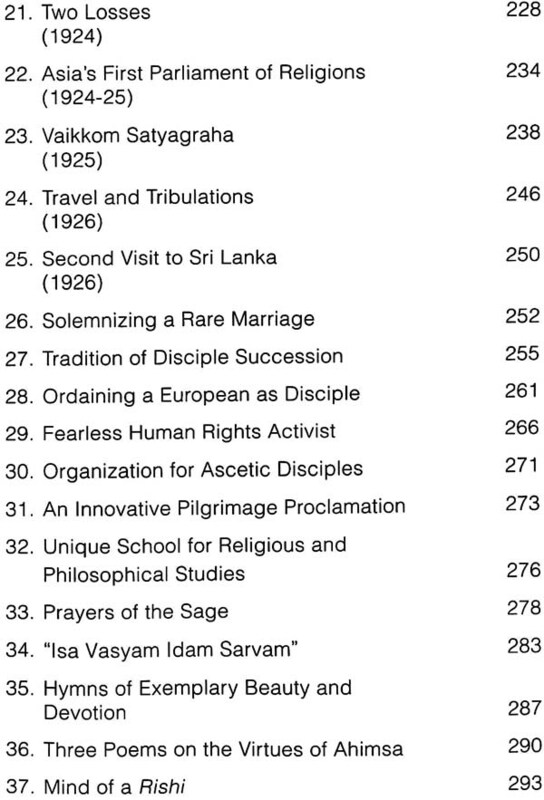 To Romain Rolland, the French humanist and writer, who happened to read about Sree Narayana Guru and his philosophical writings (from the articles published in the 1930s by N. Natarajan, who introduced Sree Narayana Guru to the western world), he was a " Jnanin in action" or sage-intellectual and activist. 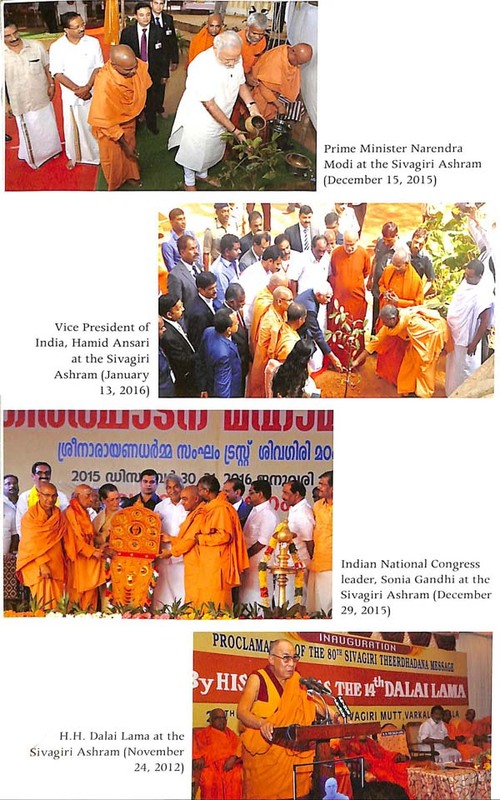 Mahatma Gandhi was tremendously influenced by Sree Narayana Guru's views on religion and caste. 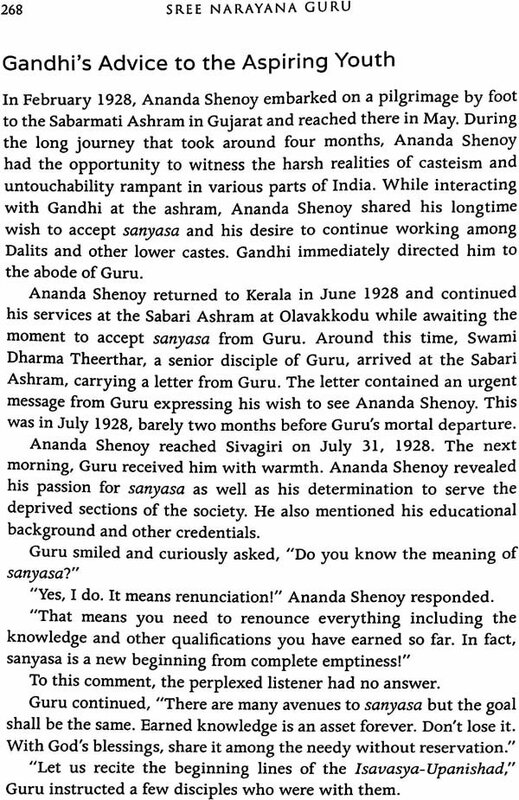 Gandhiji came to the Sivagiri Ashram in 1925 to meet the saint and they discussed a range of issues during their lengthy meeting. As a philosopher, Sree Narayana Guru was a follower of Advaita which is the nectar of the Upanishads, the foundation of India's ancient wisdom. The Advaita doctrine establishes that individual self is not distinct from the Supreme Being Brahman. Even though Advaita as a doctrine was extracted from the Upanishads by Sri Shankara, the 8th century sage and philosopher, it was Sree Narayana Guru who transformed the Advaita philosophy from an elite theoretical doctrine into a relevant principle of practical applicability. Thereby he expanded its scope to effect phenomenal social changes, and enabled one of the most profound yet bloodless social revolution in history. As a social reformer, Sree Narayana Guru's impact was matchless in history. Those who had been denied basic human rights for centuries were able to experience dramatic changes in their lives due to the awakening caused by Guru's teachings on self-improvement and self-empowerment. The focus on education, organization and entrepreneur ism that he insisted on to secure freedom, strength and prosperity remains an ideal and timeless model for peaceful changes in the condition of suppressed and marginalized people of any society. Sree Narayana Guru instructed people on the importance of faith in God as they navigate through the troubled waters of life. He composed many hymns and devotional prayers for the faithful so that they could lead a calm and content life. The defining theme of his vast philosophical writings is the oneness of human race transcending all peripheral differences. His earnest call for mutual respect and understanding among all religions is a lesson that is still to be learned. In the following pages, I strive to unravel the multifaceted personality of Sree Narayana Guru as a saint, sage, siddha, yogi, socio-religious reformer, thinker, educator, philosopher, pragmatic visionary, and poet. 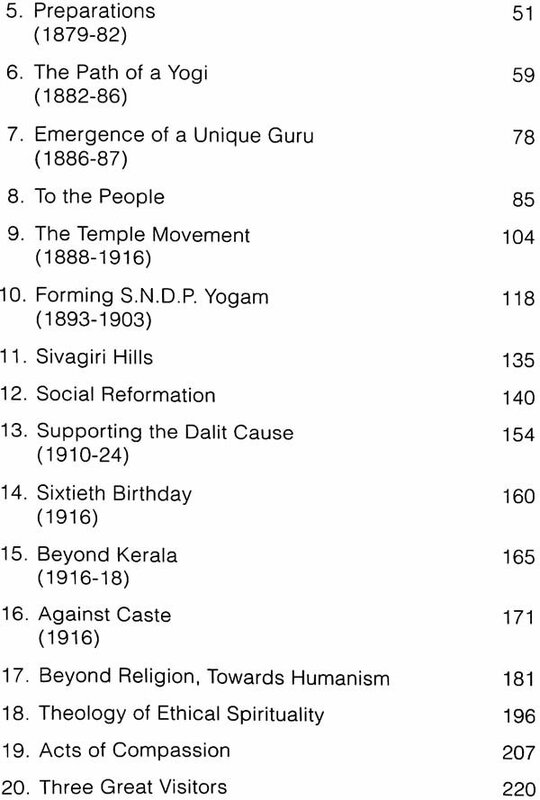 While writing this book, I enjoyed reading many of the available biographies on Guru, and I am immensely indebted to all the biographers and commentators of Sree Narayana Guru, in Malayalam as well as in English. Their works have been a great source of information. 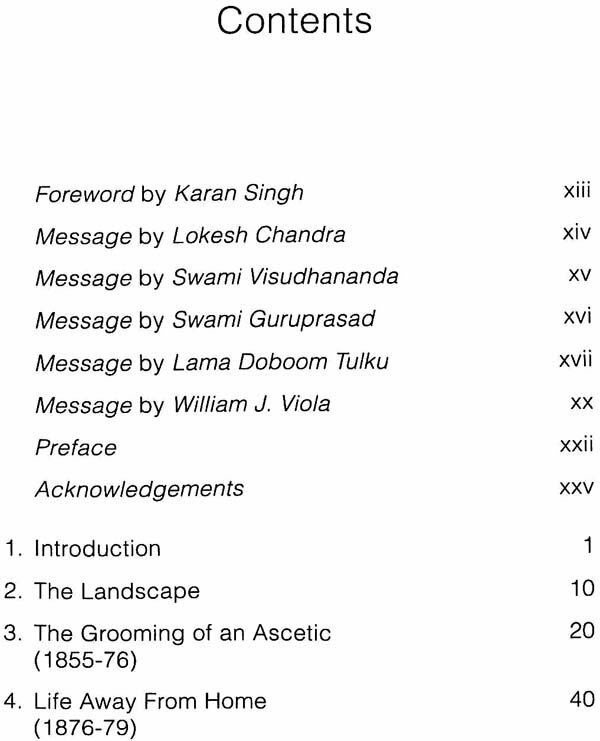 I would like to add that all translations of Sree Narayana Guru's original statements, hymns, prayers and poems that arc part of this book are my own, and I tried to the best of my ability to reflect its intended meaning in my translations. 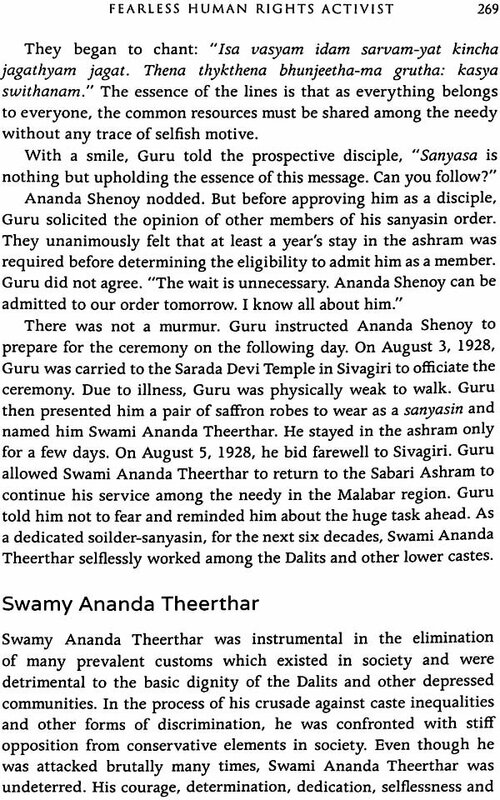 As I attempted to grasp the profundity of Guru's concepts, the analysis and interpretations made by scholars and acharyas provided me great insights. In this regard, let me express my gratitude to Professor G. Balakrishnan Nair, Dr T. Bhaskaran, Nataraja Guru, Nitya Chaitanya Yati, Swami Muni Narayana Prasad and Srimad Satchidananda Swami. This book is the culmination of strenuous efforts during the last several years. During a time in my life when I was confronted with many serious challenges, this undertaking gave me hope and a sense of purpose. I took this self-imposed assignment as my life's mission. I hope readers around the world would find this book informative and interesting. I wish that a new generation of biographers of Sree Narayana Guru may find this a useful resource. I wish to apologize for any lapse or shortcoming you may find in this book. May Guru bless you all! Personally, I am not completely convinced of my worthiness to 1 undertake a noble venture such as this. After graduating from High School, I had an intense desire to join Guru's ascetic mission but I was unable to pursue my wish due to force of circumstances. Since then, fate has taken me through unfamiliar landscapes. 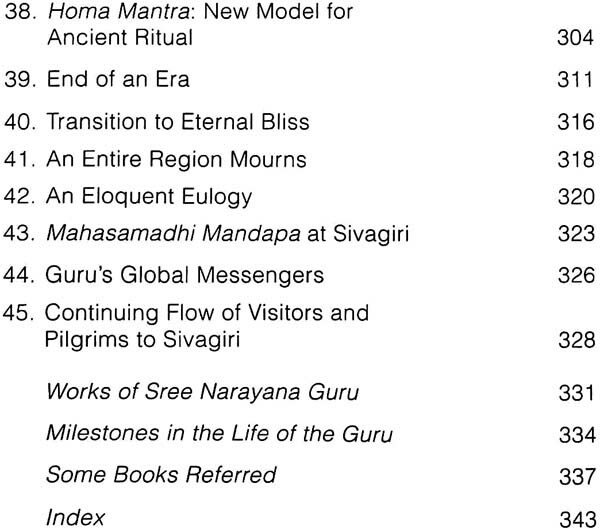 Along this journey, the grace of Guru has led me through the troubled waters of life. For the last forty years or so, regardless of the situation, I seldom spent a day without reading, writing or thinking on Guru. And in the last few years, I spent a considerable amount of time reading about Guru as I was writing and rewriting this book. The life and philosophy of Sree Narayana Guru is like a wide ocean. As a child playing on its shore, I only claim to hold a tiny shell-full of knowledge of such a boundless source. Yet, I believe that Guru has mercifully granted me a certain level of understanding on him to go ahead with this attempt and I felt his blessings while writing this book. To my great surprise, on many occasions, words, ideas and passages flew to me as if from a mysterious source. 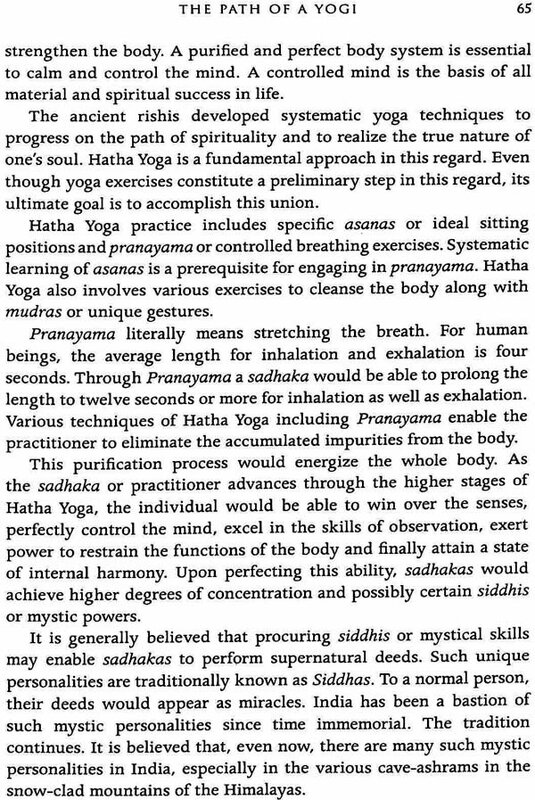 Nevertheless, the effort wasn't an easy one as any serious writing is nothing but a painful sadhana. No matter what I may have been going through, thinking on Guru, reading his verses or devouring books on him was to me a blissful escape. 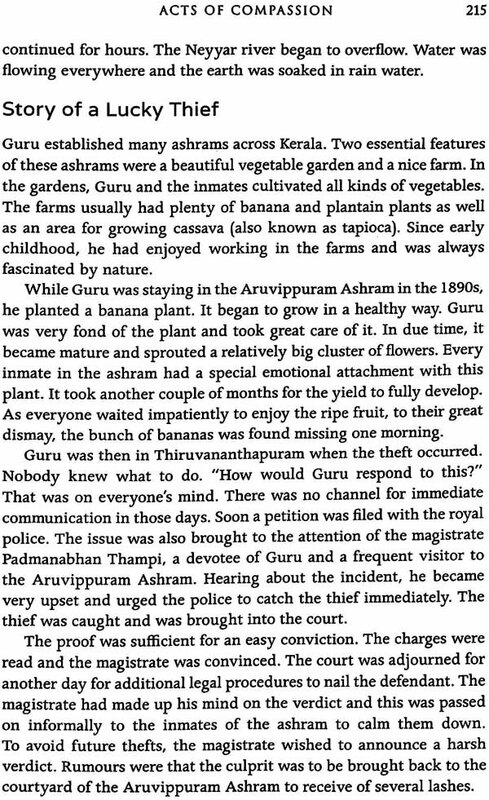 Such transformative experiences would undoubtedly prompt anyone to wonder at the amazing grace of the great Guru who lived barely a century ago, leading an illustrious life while being a humble sage and detached ascetic. To me, the experience was profound. It allowed me to study more diligently the life and persona of the great sage who has been my guiding light since I was a young boy. The major part of this book was written while I was in the United States. I studied, worked and lived in America for most of my adult life. To me, America has always remained a land of many contradictions as well as amazing resilience. I was a resident of Philadelphia for many years. It was in this old city that America was born two hundred and forty years ago. I was often fascinated by the noble vision espoused by the founding fathers of this new nation who devised the magnificent document, the Declaration of Independence, in 1776. This famous proclamation was the central theme of the assembly in Philadelphia during the American Revolution. I was fascinated by the immortal statement enshrined in the preamble of the Declaration of Independence. It reads: "We hold these truths to be self-evident, that all men are created equal, that they are endowed by their Creator with certain unalienable Rights that among these are Life, Liberty and the Pursuit of Happiness." Sree Narayana Guru's vision of the Ideal Abode where all humans throng together in true brotherhood was proclaimed in 1888. I was enchanted by a certain level of resemblance Guru's vision had with the American Declaration of Independence. Modern America, even though far from perfect, was shaped by humanists and innovative thinkers such as Benjamin Franklin, Thomas Jefferson, James Madison, Thomas Paine and Patrick Henry. The above statement was a product of their collective ideals. America is also the land of the great humanist Henry David Thoreau. It was his acclaimed essay of 1849 "Civil Disobedience" that inspired Mohandas Gandhi while in South Africa. Gandhi practically applied Thoreau's principles first in South Africa and then in India during the freedom struggle. Later, Martin Luther King Jr. passionately emulated Gandhi in the 1960s during his protests against the grave injustices of the American society. Like the caste system of India which continues to divide and degrade people, the American society is also to an extent still divided on the lines of race. 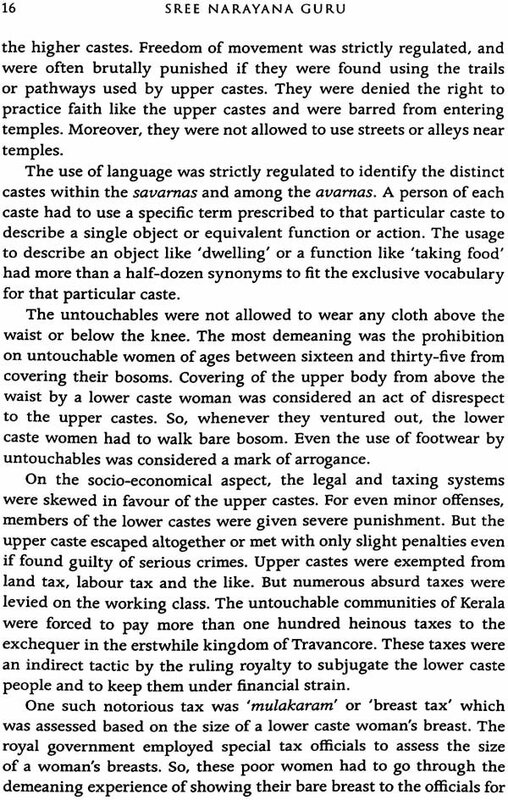 The caste system flourished for centuries in India with all its dehumanizing traits regardless of a noble spiritual heritage and an all-encompassing philosophy that envisioned the oneness of all beings. Paradoxically, modern America, which produced one of the greatest documents on democracy and individual freedom, is also stained by the fissures of race and a history of slavery. Yet I am convinced that both nations, however imperfect, possess inherent strengths and unique characteristics. As a beacon of hope for tomorrow's global nation, America as well as India exemplify the values of unity in diversity. Whenever I walk through the streets of Philadelphia, I see the friendly faces of a multitude of people of many races and ethnicities who share links to different nations, continents and cultures. Beyond the outward features of multiculturalism, I feel in this soil the symbolism of an ideal abode of humanity envisioned by Sree Narayana Guru. I hope that a nation like this would one day recognize the true greatness of Sree Narayana Guru and his vision of the one-world. Today, we are exasperated by the chain of adverse challenges to our wellbeing as human beings. As our world is marred by madness from many quarters that threaten not only peace on earth but our very existence as a race, the internalization of values that promotes in all of us a transformative feeling of mutual understanding and respect is the need of the hour. The daily dose of horrifying news on acts of terrorism and loss of innocent lives, the never-ending unholy wars between religious and political factions, the rise of fundamentalism around the globe, the collective animosities and the widening divide between different castes, races and classes have taken away our peace of mind. Besides we face many threats to our delicate habitat in the form of environmental pollution and other atrocities toward nature. The ancient rishis of the Upanishads as well as the prophets, sages and mystics of every religion and culture across the globe have guided mankind since antiquity to tread the path of virtue whenever forces of darkness try to lure us. Sree Narayana Guru's life, messages and philosophical works exemplify this great tradition of moral and ethical purification. I hope my humble attempt here to communicate with the reader on the versatile personality of this modern sage will be received as a positive endeavour in this challenging time. I hope that an understanding of the unique life and humanitarian philosophy of Sree Narayana Guru will not only help to overcome the self-deluding identities imposed by caste, race or ethnicities but also enable us to bridge the wide divide between religions, nations and people.